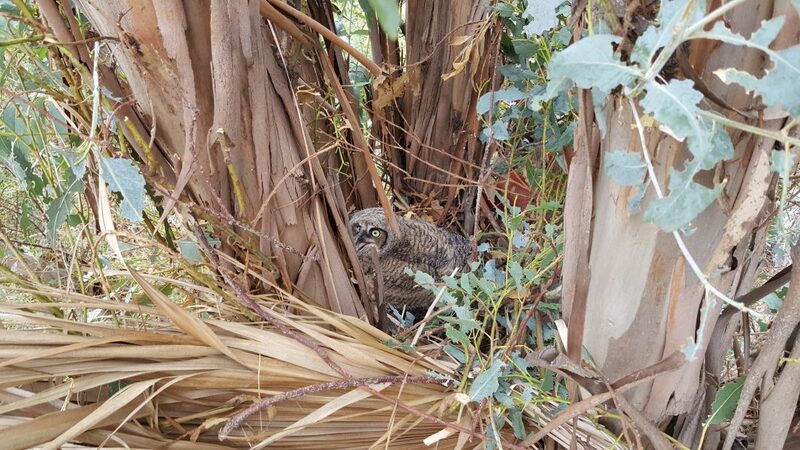 How many people does it take to rescue a baby owl? Here’s a story as good as just-baked bread! 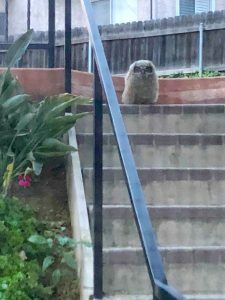 Recently Debi had heard owls in the eucalyptus grove on her back slope. But at the moment, adult owls nor a nest could be seen, and this youngster was now at risk. What to do! “I called every source I could find on the internet, including two fire departments.” she said. After leaving a trail of phone messages she kept her distance, watched and waited. At about 9am Ann Lynch, Director of South Bay Wildlife Rehabilitation Center responded. From Debi’s description Ann was able to confirm that the bird could not fly and needed to be placed high in a tree for safety. But Debi did not have a suitable ladder. 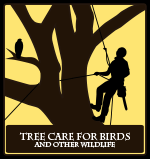 That’s when Ann contacted Gillian Martin of the Tree Care for Birds and Wildlife Project. Did she know a tree care company that would help? 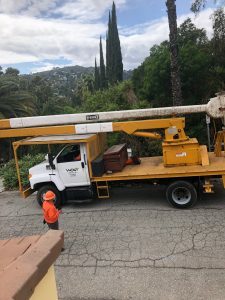 A few calls and emails later, West Coast Arborists was the one that said yes! We might have guessed! How could the good intentions of humans be obvious to an owl?! Nosiree! I am not surrendering! Every bird’s instincts are just that. So yes, the rescue team was led on a merry chase. 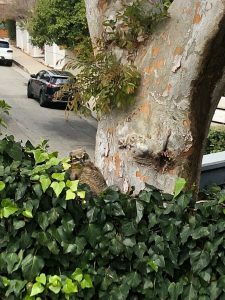 Debi’s ivy-covered fence became a convenient ladder for the scared bird to get to higher ground and try to blend in with a nearby tree trunk. It didn’t work. They tracked him. Now everyone’s eyeballs were locked on each other and nervously anticipating the next move . 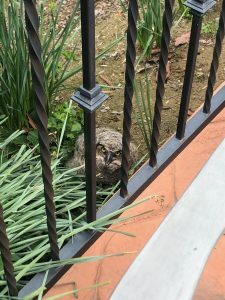 The next caper involved a squeeze and a wriggle through Debi’s wrought iron fence and into the neighbor’s yard. How do we reach him now?! Would a pool pole with a net work? Nope! The net turned out to be too small. OK! Let’s take you to the finish line. The team finally cornered their feisty target and placed it in a covered cardboard box. A new, safe nest had to be made. The guys were ingenious. Several dead palm fronds in Debi’s yard were used. 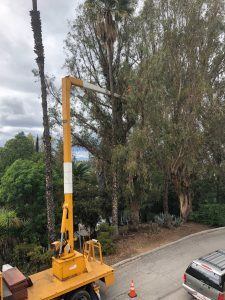 Finally, the boom could be employed to hoist both nest and nestling high into one of the eucalyptus trees. 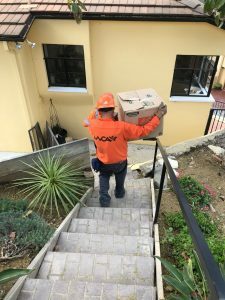 It was about 5pm by wrap up time but the guys would not leave until another call was made to Ann Lynch to gain her reassurance it was safe to leave the bird there—they were not so sure. Ann gave the thumb’s up. Debi offered to pay them. No thank you, they would not accept payment. Later that evening Debi observed the parent owls fly out of the trees. Had they quietly witnessed the rescue of their youngster? Either way, they would surely resume care of it. Unless a bird is injured, this is the best plan when baby birds fall from their nest. Sometimes words of admiration and gratitude cannot equal the occasion. 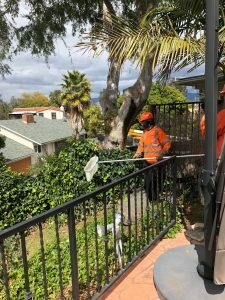 If you are a tree care provider and would like to be a first responder in similar situations, please contact either your nearest licensed wildlife rehabilitation center (here is a link for California) or the Tree Care For Birds and other Wildlife project. 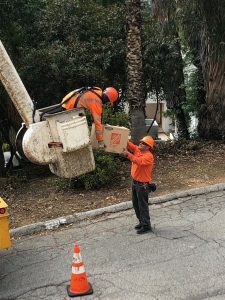 West Coast Arborists are superior in care, responsibility and leadership, not to mention their generosity. Kudos and love to all who made this rescue possible. 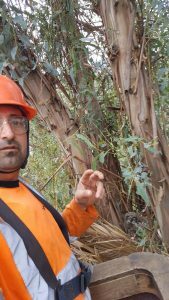 Lovely story–bless West Coast Arborists! 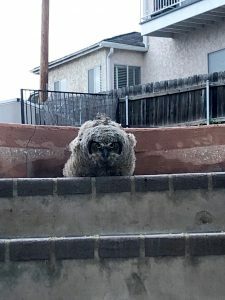 Bless that little Great Horned Owl family too! Thanks for sharing this heart-warming tale. Thank you for posting this wonderful story.